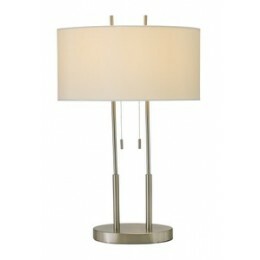 Adesso Luxor Contemporary Hotel Stlye Elegant pyramid Shaped Square Steel Base Tall Home Table Lamp features elegant pyramid-shaped square steel base has a white silk-like fabric drum shade with three-way touch sensor switch. Its contemporary design adds modern touch and functionality and its diffused light provides subtle relaxing mood in any room setting. Pyramid shaped square steel base. White silk-like fabric drum shade.